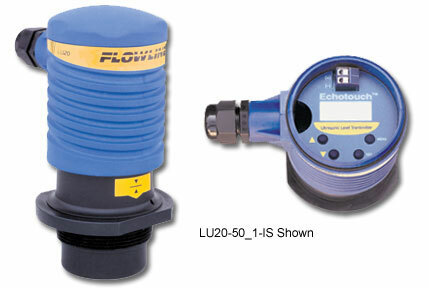 The Flowline EchoTouch LU20 is CSA approved and is intrinsically safe for use in general purpose or hazardous applications. The two-wire ultrasonic level transmitter gives non-contact level measurement for up to 5.4 meters and is perfect for challenging environments including; corrosive, slurry or waste liquids. The Flowline EchoTouch level transmitter is compact, hard wearing and the push button calibrated transmitter is reliable and easy to configure. The device is typically selected for atmospheric bulk storage, day tank and waste sump applications located within a classified area. CSA approved intrinsically safe for use in general purpose or hazardous applications, the two-wire ultrasonic level transmitter provides non-contact level measurement up to 5.4m and is ideally suited for challenging corrosive, slurry or waste liquids.